Write the correct part of the body in the suitable place. A funny way to study the body parts. An exercise to learn about our skeleton. Listen, read and write. An exercise for beginners with elementary parts of body. 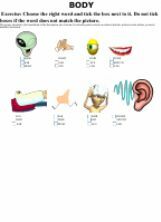 Suitable for young learners with assistance of an adult. A good way to learn the topics of unit 2 of the book Surprise 4. Enjoy it. 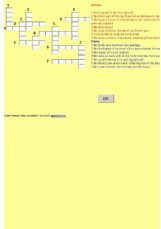 The crossword puzzle helps higher-intermediate/advanced learners to practice vocabulary related to body parts. 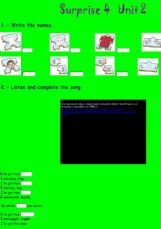 There are 14 clues (definitions)and the students have to fill in the words that match them. 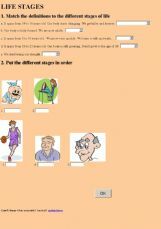 Review and practice the different life stages. A little math in English to calculate how many of each body parts one, two, three etc.. have. Calculate from 1-60 then use a few adjecties to describe people.